Shirts With Random Triangles: Georgia DT Jonathan Ledbetter Arrested On Alcohol-Related Charges For Second Time In 2016. Georgia DT Jonathan Ledbetter Arrested On Alcohol-Related Charges For Second Time In 2016. Jonathan Ledbetter. Image via dawgnation.com. 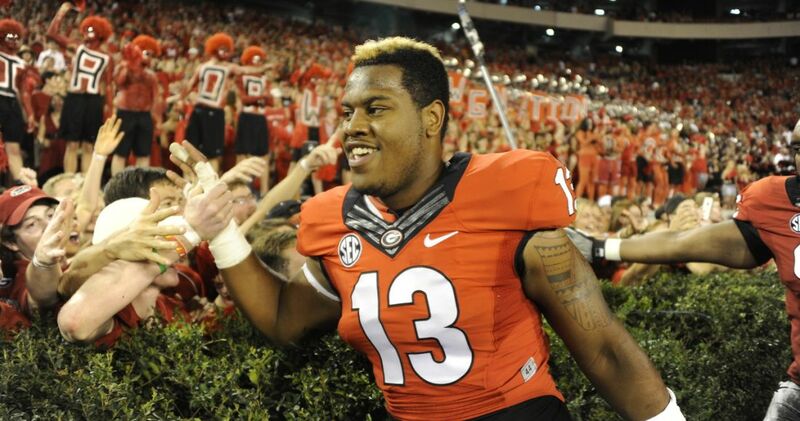 Georgia sophomore defensive tackle Jonathan Ledbetter is in trouble with the law again. Ledbetter was arrested Sunday morning of what ESPN describes as "misdemeanor charges of driving under the influence and underage alcohol possession." Few details regarding the incident are available. Ledbetter was arrested by Athens-Clarke County Police early on Sunday morning, and was later released from jail on $2,000 bond. It's Ledbetter's second arrest this year. In March, Ledbetter was arrested for "misdemeanor alcohol charges," which have been since dropped. That arrest resulted in first-year Georgia had coach Kirby Smart suspending Ledbetter for the Bulldogs' opening game of the season against North Carolina in the Chick-fil-A Kickoff Classic at the Georgia Dome in Atlanta. There is no word from Georgia on the arrest. It's the eighth arrest involving a Georgia since Smart was named head coach. Six of those arrests involved three players - Ledbetter, cornerback Chad Clay, defensive lineman Chauncey Rivers. The later two have since been dismissed from the team.